Miracle noodle reviews are important if you want to assess if these noodles are truly miraculous. 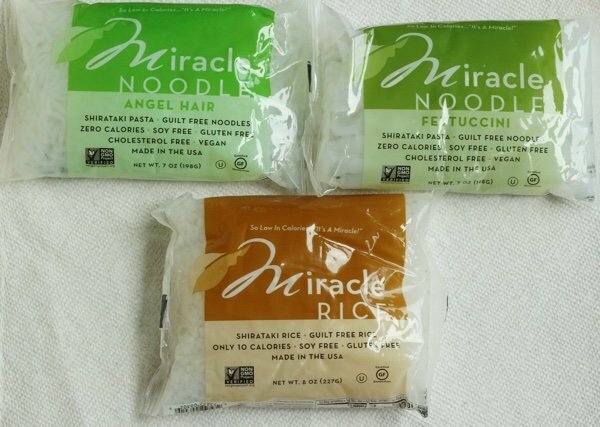 Have you heard of Miracle Noodles? I reviewed them back in 2012 in this scintillating article Miracle Noodle Review. I decided to give them another try to see if my opinion would change (or if they were any different). There are three varieties – fettuccini, rice, and angel hair noodles. The noodles are packed in bags with liquid (unlike dry noodles). I bought mine on Amazon (see below). They cost about $2.25 for 7 ounces – which is a lot more than regular pasta. Miracle noodles feature ZERO calories (the rice is 10 calories) because they are made from soluble fiber from the Konnyaku Imo plant. I wondered if it was some sort of chemical trick but it isn’t. These noodles are all natural. Have you ever seen a package of noodles with zero calories per serving? 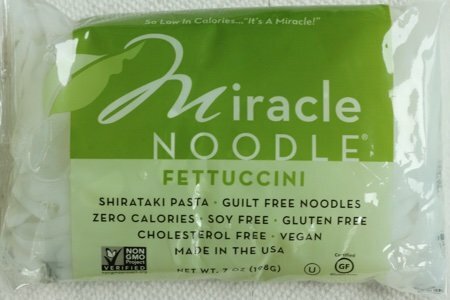 The “miracle” part is that you can eat noodles without calories. Unfortunately they take a lot of work to prepare compared to your regular dump and boil pasta. First, you pour them out of the package into a sieve and rinse them. They smell a bit like fish. You rinse them for about 15 seconds before you boil them for 2 minutes. Using tongs you take the noodles out of the water. 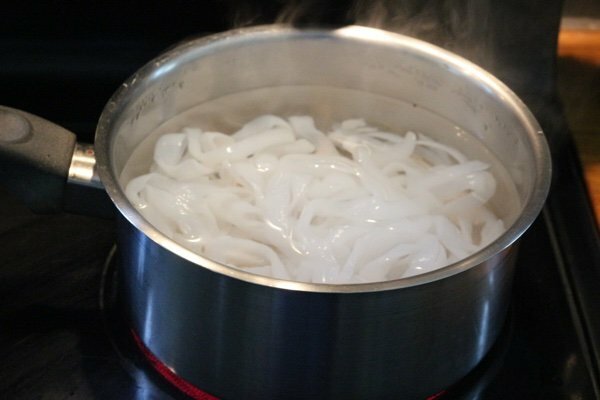 Then you dry them in a non-oiled pan and use them like you would any other pasta or rice noodle. Now they are ready to use in your favorite noodle recipe. They look more like rice noodles than fettuccini made with wheat. But, how do they taste? I gave some of this to my daughter and she reacted very negatively. She said eating the noodles was like eating squid without any flavor. 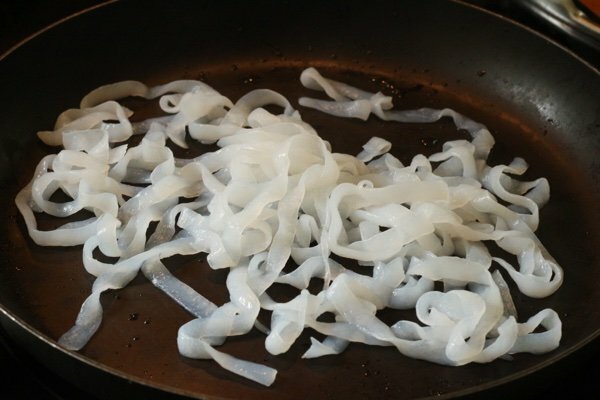 I found them very rubbery and strange – unlike any noodle I have had before. 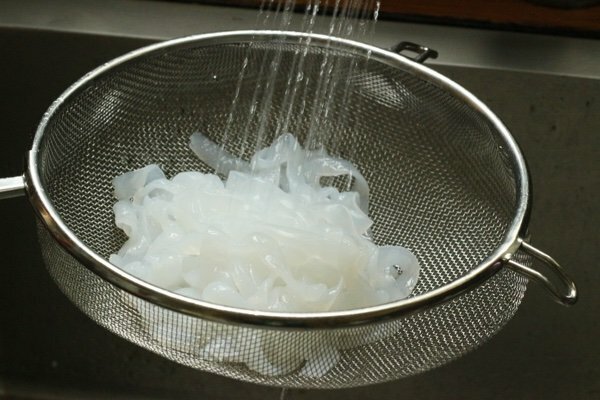 I think that if you are accustomed to textures like these noodles – rubbery and gelatinous – you will like the noodles. For us Italian pasta lovers out there, these are not going to cut it for a replacement. The angel hair Miracle Noodle variety is a bit more palatable. Treat it like a rice noodle and make my stir fry zucchini noodles recipe. Better yet, skip the Miracle noodles and just use zoodles AKA zucchini noodles as a pasta substitute. The zucchini noodles will be less expensive and more familiar to most of us – with a little crunch and a summery flavor. Please share your Miracle Noodle reviews below. Thank you, Lisa, for settling this for me. I suspected these noodles weren't great, and I find zucchini noodles to be a good pasta substitute. I won't waste my money on Miracle Noodles. Oh no. You lost me at they smell like fish. I don't do seafood. None. At all. Ever. I actually kind of like Miracle Noodles. The fish smell goes away once you rinse them and dry them. I like them in soup, especially in my homemade pho. My issue is that they give me such an intense bellyache, that I do not eat them. I think if you try them in some kind of sauce, you'll like them better. Also, they're cheaper at Shop Rite. I had these once and never again! They smell horrible, and of you can get past that the taste is even worse! Your description was spot on. Slimy, chewy, gelatin like. Horrible. I was rather spend the ww points and have a small portion of real pasta!!! Agree this is no sub. for pasta. I use nuPasta mixed with zoodles. This product is very like spaghetti with 25 calories per serving. Texture is better than Miracle Noodles, although can be difficult to find. I really tried to like these back when Hungry Girl was pushing them. I tried prepping them lots of ways, but couldn’t get past the texture. My kids and husband hated them. Glad you tried them again and shared your thoughts! I have looked at them at the store several times and am glad I didn't waste my money! That's how I thought they may taste! They are terrible. You have to add so much flavor that they soon become high in calorie and it was like eating a big bowl of rubber bands... GROSS is all I can say.. And boy it can leave you with a nasty stomach ache! Nope. Tried them before. No. Couldn't get past the rubber texture. No way. I'm thinking rubber bands also have no calories, but might have more flavor. NO. Life is too short to choke these down. I wanted to add that I do not buy them on Amazon nor do I pay that much. I get them at the grocery store. The icky smell goes away after prep. I just rinse well and microwave for 3 minutes. I do suggest getting as much liquid out of them as possible! I use 4 paper towels and make a fist and push hard in a strainer numerous times before and after cooking. My daughter has been using these for several years. She has a dish she makes with the rice ones and cheese. She is on auto ship for the rice ones from Amazon. I used the noodles some when I was doing WW and liked them fine. The current eating plan I am following does not have them on the food list, so I am using Zoodles instead. I tried these and couldn't get past the texture. My go-to pasta substitute is the faithful spaghetti squash. Zoodles come in as a close 2nd. I find these work best with a strong sauce. I use these to make an Asian honey chili chicken and the strong sauce works well with the noodles. I don't think I'd eat them by themselves, but they are useful in specific recipes. Shirataki noodles, found in the asian section of many grocery stores are pretty good. They are made from yams. The angel hair version are identical to cellophane noodles in Asian salads. Just like the miracle noodles they have to be rinsed thoroughly. There is another zero noodle made from tofu. If you like rice noodles or cellophane noodles these should be palatable. I use the Shirataki brand with Laughing Cow cheese and shrimp -- kind of an al fredo -- and I love it!! I wouldn't even try them without sauce on them. I toyed with buying these. Now I am sure I won't. I am completely for regular pasta. Sorry, I don't see a good substitute yet. Thanks for the review though. It was very helpful and tipped the scales for me.